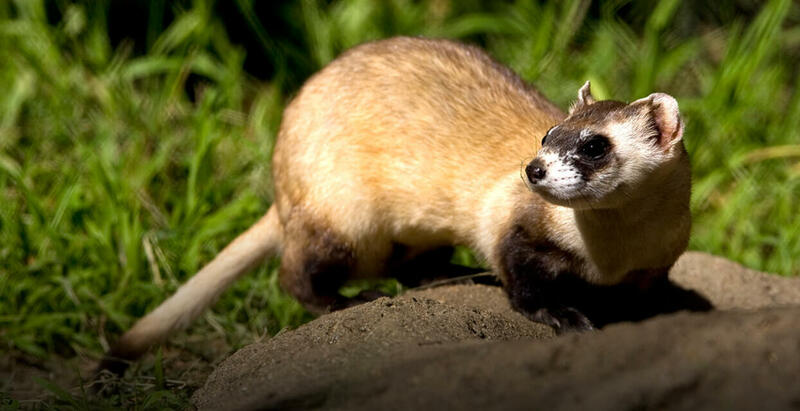 Thought to be extinct in the wild, a small population of black-footed ferrets was rediscovered in Wyoming in 1981 when a ranch dog returned home with a dead ferret in its mouth. When canine distemper devastated the small remaining population in 1987, the conservation community mobilized and a captive breeding effort was initiated just in time to save the species from extinction. Over 8,000 kits have been produced and their offspring moved by our partners to 18 different reintroduction sites that collectively support approximately 500 wild black-footed ferrets. However, all of the reintroduced populations are susceptible to plague, and just three of them are considered to be self-sustaining. The Association of Zoos and Aquariums has established a Species Survival Program (SSP) for black-footed ferrets and this species has been cared for at the San Diego Zoo Safari Park as part of the effort to maintain an assurance colony. However, all black-footed ferrets today descend from just seven wild-caught individuals, and inbreeding and loss of genetic variation are serious concerns for the long-term survival of the species. Fortuitously, it turns out that cell cultures from a male and female black-footed ferret that have no descendants in the living population were banked by our Conservation Genetics team in the Frozen Zoo® in the mid-1980s. Whole genome sequencing suggests that these individuals possess important genetic variation that is no longer present in the living population. The Black-Footed Ferret SSP is poised to utilize cultures from the Frozen Zoo® to restore much needed genetic variation into the extant black-footed ferret population through advanced reproductive technologies such as artificial insemination and cloning.